The answer to Astrid’s panchan question? They’re yours, sis — to do with as you like. Panchan is an integral part of a Korean diner’s table and meant to be enjoyed throughout the meal. I promise: no one’s going to give you six lashes with a wet buckwheat noodle if you nibble before your “main course” is set down. 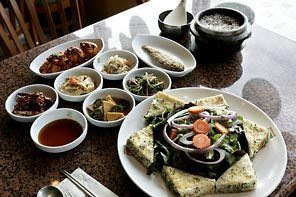 At Korean restaurants, you’ll invariably see other diners putting bits and bites of those nibbles into their accompanying rice bowls. And you should be aware that the array of panchan varies from one place to the next (and one day to the next). You’ll find that it generally includes kimchi, bean sprouts, daikon radish, fish cake and leafy greens — among other spicy and salty savories. And if you’re lucky, you may also get a small dish of teensy dried fish: sweet as candy and undeniably delicious, once you get past the “Hey! This looks like dead minnows!” factor. Feel free to ask for more of any of these side dishes, bearing in mind you’re not meant to make a meal out of them — though believe me, I could. Among the Korean restaurants I frequent are Hosoonyi (famous for its soft-tofu soup) Cho Dang Tofu (where I photographed that “chicky” from the adjacent Chicky Pub), Hae-Nam Kalbi & Calamari (whose parking lot houses my favorite taco bus), Shilla (downtown, near the Seattle Times office) and BCD Tofu House (where the panchan includes spicy crab in its shell and the doors are open 24/7). I’m fortunate to live north of Seattle, where there’s a huge Korean community and lots of restaurants catering to it, but the South End (particularly Federal Way) is also a hotbed for the salty/spicy foods of Korea. 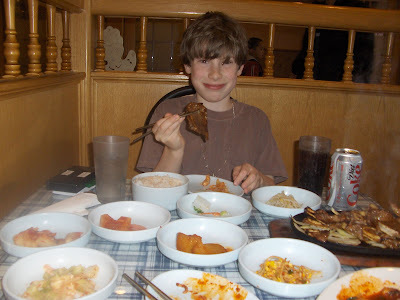 So tell me: Where do you go for Korean food?